Pru overcame early failure; can Government Center be next? A rendering of the proposed 17-story tower at the Prudential Center complex. 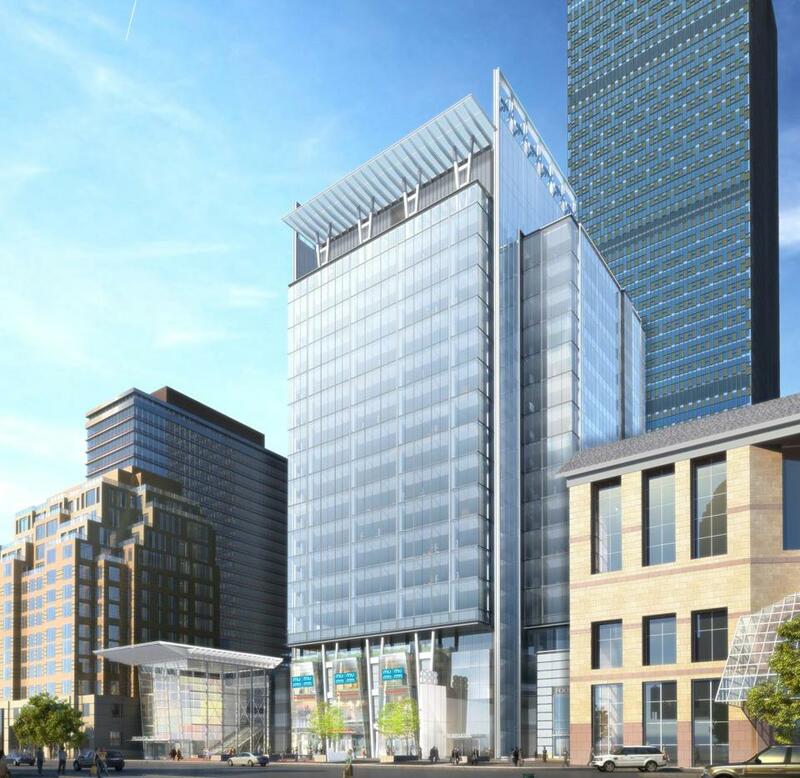 NEXT MONTH, the developer Boston Properties will begin work on a mid-rise office building at 888 Boylston St., directly in front of the main tower of the Prudential Center. The building will rise above a plaza and terrace outside the Center’s food court, filling in the last remaining development parcel of the complex. More important, the new building will close out a successful effort to rescue the original Prudential Center plan from itself. The Pru has been a work in progress since the late 1980s. And it has progressed. Once a suburban-style office complex, it is now thoroughly urban. And if this massive, once-barren pile of concrete can become a bustling urban hub, there’s no excuse for a place like Government Center to be as awful as it is. Construction crews have been buzzing around the Pru for the better part of two decades now. They’ve been building condominiums, apartments, retail shops, and glass-clad office towers, working to knit the Prudential Center together with the city that surrounds it. Work in the area has been happening for so long that it’s easy to forget what a wreck the Prudential Center used to be. When construction began in 1962, Boston was an economic backwater. The Custom House Tower had been the city’s tallest building for nearly 50 years. The city was in the middle of a crippling population dive; more than 100,000 Bostonians fled for the suburbs between 1950 and 1960. The Prudential Center was an attempt at reversing the outflow. Boston officials hoped that constructing a massive office tower and shopping center above an old Back Bay rail yard would create a magnet that would draw corporations, shoppers, and residents back into the city. The Center rose as a fortress apart from Boston, with the tower signaling, from a distance, that Boston was on the move. And the project did kick off a wave of construction that created Boston’s modern commercial core. But the complex itself was weirdly car-centric and suburban — ringed by a protective moat of access roads and parking garages — in a way that only 1960s urban renewal efforts could be. During the same period, Boston was also demolishing the West End and Scollay Square, and replacing them with the isolated concrete towers and terrible brick plazas of Government Center. And there were similarities between the two projects: The Prudential Center’s first iteration looked like Government Center with some storefronts — an empty, windswept expanse that was meant to attract people, and wound up repelling them. But the Pru’s owners recognized its shortcomings, and have been working for decades to correct them. One of the first improvements was converting the property’s disastrous open-air shopping center into an enclosed mall. And since the property’s rezoning in the late 1980s, there’s been a concerted effort to urbanize the complex. That effort included building a hotel and condominiums along Boylston Street, where garage ramps once stood between the street and the property’s front door. It also included a new office complex on Huntington Avenue, and new residences along Exeter and Belvedere Streets, where the Pru had once been ringed in blank walls. At 888 Boylston, they’re yielding more offices and shops. The dominant theme in all of this building and rebuilding is one of trading empty spaces for places people can actually use. It’s recognizing that the 1960s left Boston with too many grand, needlessly open plazas that have no relation to the blocks around them. It’s a conscious effort to urbanize the city. And, with so much work to do around City Hall Plaza, there’s no reason it should end with 888 Boylston.